I don’t make tuna salad like anyone else I have ever known, not even my own mother. I don’t remember having tuna salad sandwiches much growing up, probably because my small herd of younger brothers considered it to be a ‘Girl Food’ and disliked tuna in general unless it was thoroughly hidden in a thick casserole of egg noodles, creamy white sauce and cheese. I moved from my family’s home to my husband’s without a lot of thought thrown towards cold salad sandwiches, I was more intent on trying to impress my dearly beloved with good roasts and fluffy pancakes. One day, early on in the marriage, he requested tuna salad for dinner. Thinking back on it now, I do believe it was the first food he asked for as a married man and I remember my wifely heart sinking a little. “Tuna salad – really?” I didn’t even remember how to make a tuna salad. “Oh yeah, tuna salad. With pickles and artichokes…” My husband licked his lips and wandered out of the kitchen, leaving me in dumb bewilderment. Pickles and artichokes? In a tuna salad? But how? What’s an artichoke? Let me remind my dear reader that this was slightly before the Great Revelation that he didn’t really care for Butter – something which he very neatly announced at dinner one evening and nearly made me choke on my own life’s breath – so I wasn’t yet *fully* acquainted with my new husband’s eating preferences. There’s so much adjusting that goes on in those first few months, it’s a little dizzying and love truly makes the dance worth while. I got out my mixing bowls, some cans of tuna and anything else in the cupboard I thought seemed appropriate. In the very back I found a can of quartered artichoke hearts, and hidden in the far reaches of the refrigerator I found a half-eaten jar of pickles, some mayo and then I had at it. Fifteen nerve-wracking minutes later (give or take a few) and I was serving Alex the strangest tuna salad that ever was seen on this or any other planet and let me tell you what – it was awesome. I’ve been making tuna salad a’la Alex for over a year now, almost monthly as it is one of his most favorite things to eat, and we’ve tweaked the recipe into a true Gaylor Family Heirloom. Are you brave enough to try it? Chopped tomato, diced celery, chopped sweet pepper, chopped olives or avocado chunks. Instead of the seasoning, you could use a tablespoon or more of your favorite salad dressing – Italian, Caesar, French, Balsamic… the sky’s the limit. We’ve tried about every combination of additions and find it hard to make something that isn’t tasty. Dump ALL of your ingredients into a bowl and mix them together well. I usually add the mayonnaise last because depending on what else we’ve tossed in I might need a little more or less. We are not ones to like our tuna salad on the sloppy side, so I tend to go light on the mayo, but that’s just us. There is something so *Right* about family traditions. Every family has its own web of traditions that is uniquely their own. No one really knows how they start but we all think that ours are the best and *most* unique and relish in the annual opportunity to drag them out, dust them off and use them as the foundation of our festivities. 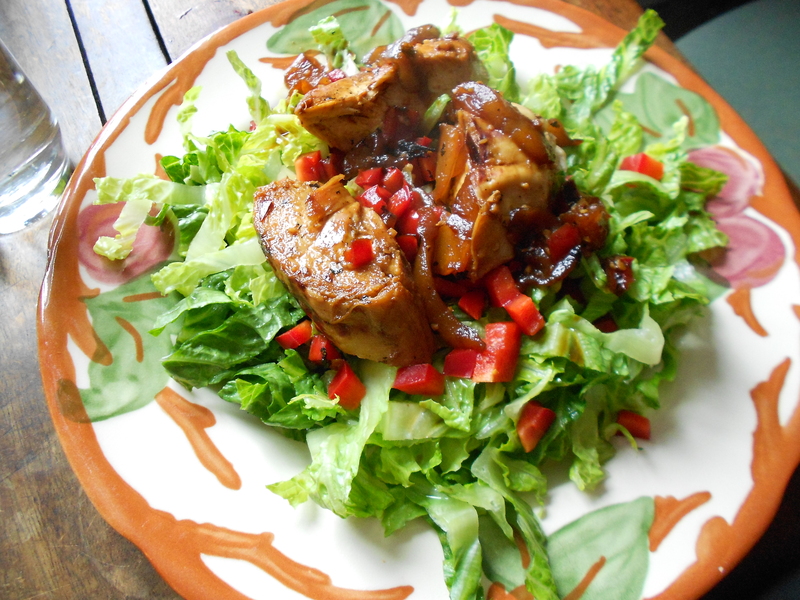 Cranberry Molded Salad is such a tradition for my family. It seems a really common sort of tradition when you first look at it, but when you remember that no two families ever make their cranberry salads alike, it becomes something reminiscent of the ancient clans of Scotland with their intricate family tartans. You bind yourself to your family’s recipe with a fierce and nearly blind loyalty – nothing will EVER taste as good as what you had growing up. It’s a bit of an unspoken rule we whisper to our babies on their first Thanksgivings, cementing the truth that this is the Only Legitimate Cranberry Salad on Earth, accept no substitutes. I’ve been at family gatherings where a tart jelly is served in a ridged roll, slid from out of a can. It’s tradition for them and their mouths water at the sight of it’s crimson self, quivering and glistening in the holiday lighting. I’ve seen it made with jello and chopped carrots and even marshmallows, I’ve seen it scoop-able and pour-able and even non-existent. Every year I can remember, I have eaten my mother’s cranberry molded salad at Thanksgiving – not really a relish, definitely not a sauce but absolutely the perfect foil to the rich line up of foods that tradition orders on that holiday. We never vary, we never waver, we never subtract or substitute. There must be cranberry molded salad, we must all have a hand in making it and it must be eaten almost as an after thought. 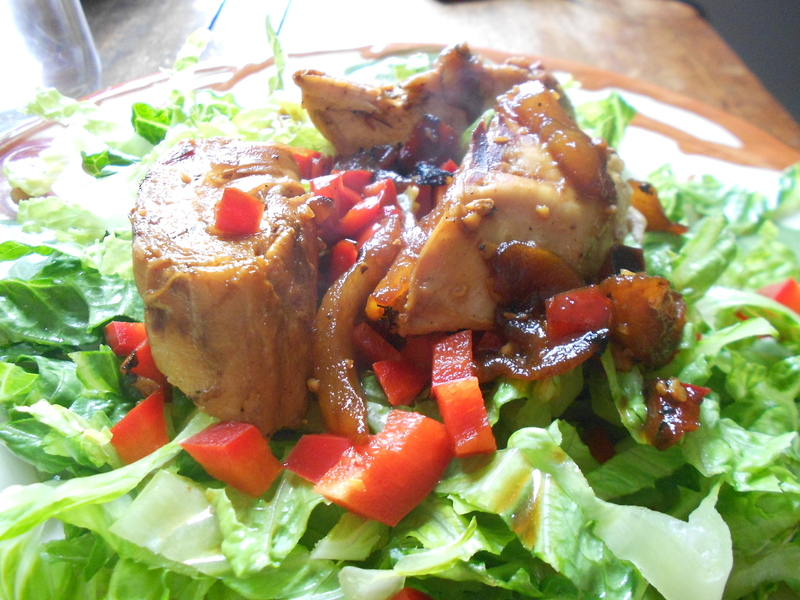 We eat it with seconds and for days thereafter in sandwiches and with leftovers. It is the last dish to be scraped clean, after we have been thoroughly saturated with Thanksgiving goodness. Every year, without fail, my mother says something to the effect of, “Why don’t we ever make this any other time of the year, we like it so much…” and every year we all wonder for a minute about what would happen if one of our holiday foods were to escape and wander into July or March and we realize that it would be Wrong. We eat cranberry molded salad at Thanksgiving. It’s our tradition and it’s a good one. Let’s not tamper with it. This makes enough to feed a small army. We like *our* recipe because it’s actually rather healthy for you. The fruits aren’t cooked and that means they are still in possession of their enzymes, making it the perfect thing to finish that incredibly filling meal with. That’s why we eat it last. Aha. In a food processor, you are going to grind the cranberries, apples and oranges ( skin and all, folks!) together then dump the whole lot into a big mixing bowl. In a small bowl, add the cold water to your gelatin and let it soften. Stir the sugar into the ground fruit *well* and add the lime juice. Once the gelatin is soft, add the boiled water and dissolve completely. Add this to the fruit blend and stir again. Cover and put in the fridge to ‘set’. This can be made a day or more in advance, it will keep quite nicely! I’m not sharing this recipe with the suggestion that anyone should try it in lieu of their own, perhaps this could be your Fourth of July side dish and it will see other parts of the year, something it never would be able to do in our house. At any rate, enjoy your festivities this week – eat heartily and be at peace! Our short little table was adorned with a patchwork of vintage linens and a clearance April Cornell table cloth. Spare chairs were summoned from the far corners of our fair home and the entire dining/living room had been rearranged in a an attempt to make room for company. Our guest list had only two names on it, but that is reason enough for a little bit of grandeur here on Park Street, and I worried about the table legs which always seem to be in the way of ours. We did our best to cool the place down for the evening and I sweated away in our room-sized oven of a kitchen, cooking away. I love entertaining – I always stress and fuss way too much and practically drive myself and the surrounding husband crazy in my effort to have everything ‘just so’. Under it all, however, is this deliciously deep satisfaction at having people come to our home and enjoy themselves. It isn’t grand, it isn’t showy and the table legs definitely get in the way, but it’s ours and we love it, and I love to welcome people into it and give them good food. The menu was braised chicken breast sandwiches with tomato, mayo and garden-fresh lettuce, a huge fruit salad (served in a carved-out watermelon because we *ARE* that stinking cute) and a potato salad, with ice cream for dessert. 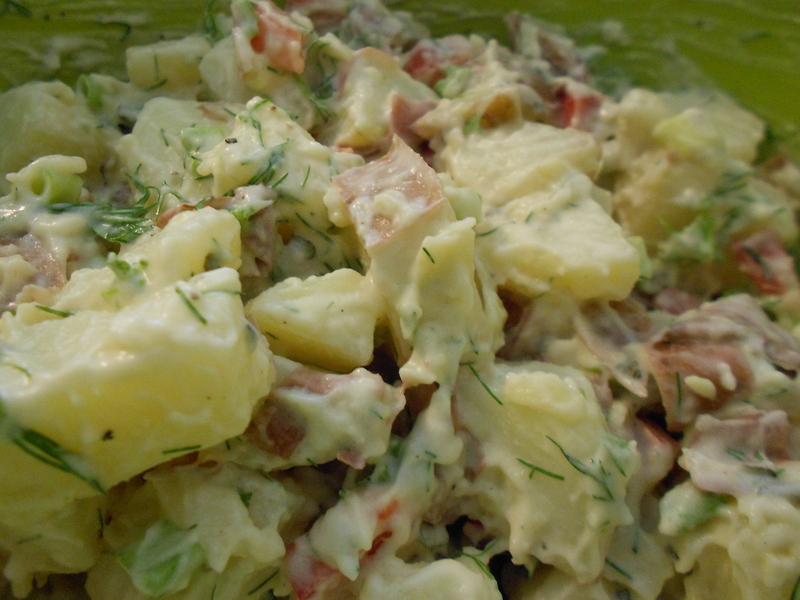 This potato salad is one that I loosely translated from my husband’s dear grandma’s salad. While we were in Maine visiting YiaYia and Papoo, she served us a potato salad that I ate an embarrassingly large amount of. It was incredible and when I asked her how she made it, she shrugged and said, “A little of this and a little of that!” She did go into the details that I was craving and I tried my best to remember it. Ever since then I have been itching at the chance to make one and try my hand at it. 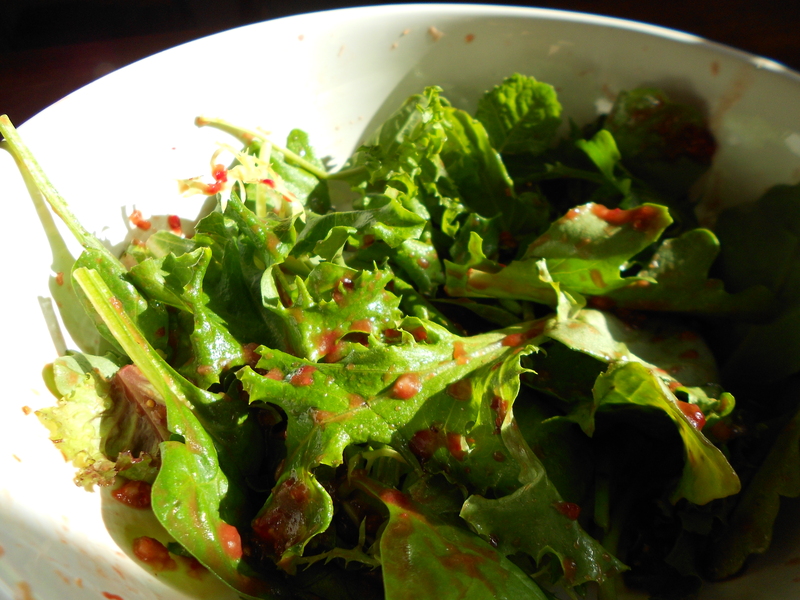 The simplicity of this salad is its perfection. 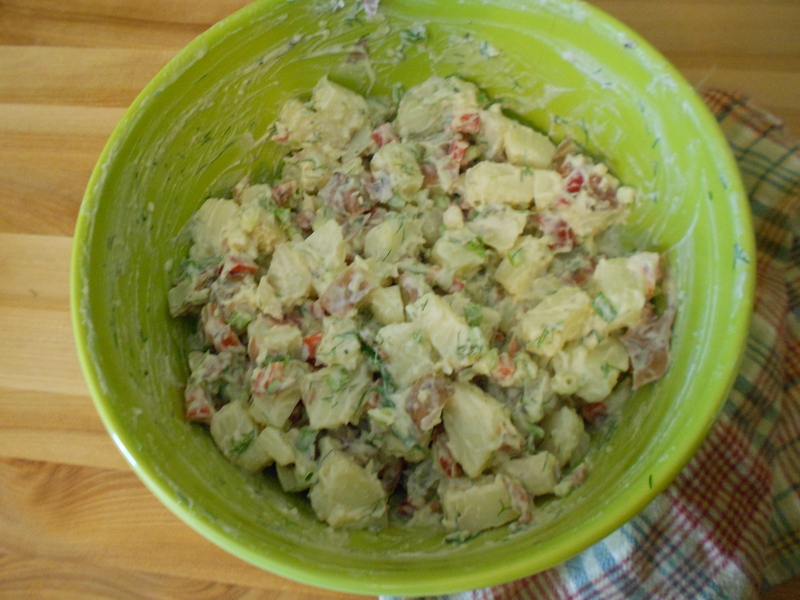 As I said before, this is not her exact recipe, but I’d never heard of using mint in a potato salad and it was awesome. Also, she used red potatoes, which keep their shape well and have an excellent texture. I liked the waxiness of them. 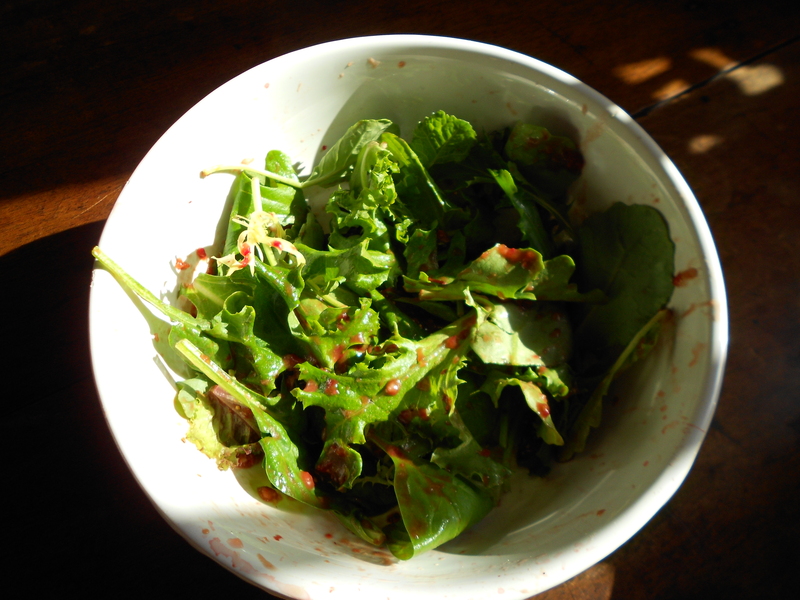 The bit of vinegar (her suggestion) cuts the mayo and brightens the salad. The potatoes got chopped into small bite-sized pieces and then mixed with the rest of the ingredients. I made it ahead of time to let the flavors meld together and I think next time I will make it even further ahead, like over night. We had a delightful evening with our guests, everything went swimmingly – everyone enjoyed their meal and didn’t knock their knees too badly. I’d say it was a success! And it’s what we had for dinner last night. Alex just started his turn on second shift, which means the dreaded nights are over. He gets home between 10:30 and 11:00 and then I have him all night long – oh, my life has gotten so much better! I love having him home! – it’s delightful to wake up next to him and then have breakfast with him, and it’s lunch time before he has to rush off and save the world. I *love* it. It’s a busy shift, so he isn’t always able to come home and eat for dinner during work which means we find ourselves eating fashionably late nowadays – I like it. Let’s face it, I’m just happy about the whole arrangement. 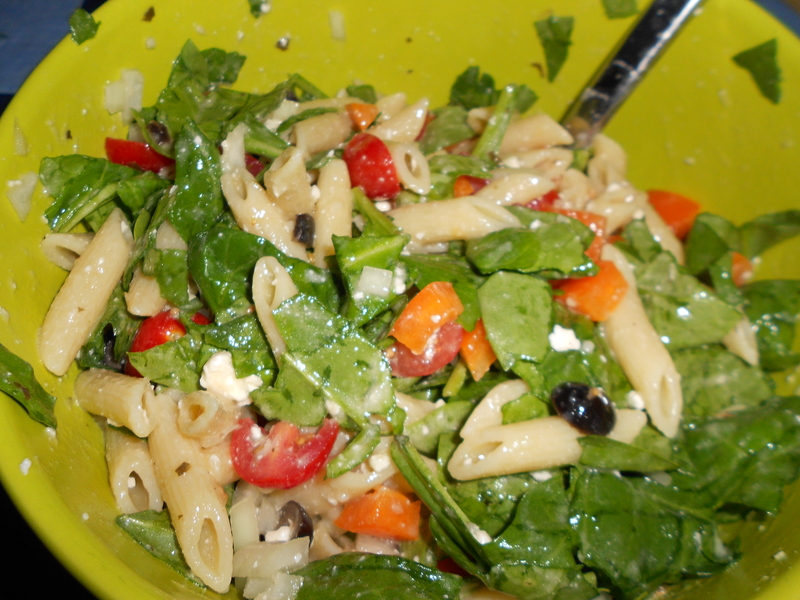 Last night we had pasta salad, my first attempt at transitioning from ‘cold weather foods’ to ‘hot weather foods’ and it was pretty stinkin’ easy.